When the Prince of peace dwells with you, peace reigns in your life. When you allow Jesus to be your master, you experience peace. The story of Jesus in the boat with His disciples on troubled waters implies that turbulence will go on outside of your boat. 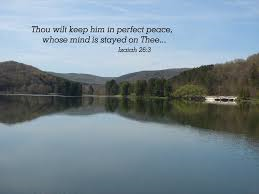 However, perfect peace reigns on your inside. Unlike the erroneous believe of some, that once you are a Christian, you no longer experience problems, Jesus confirmed to His disciples that they will be faced with trials. They were promised a life of turmoil. But they should be of good cheer because Jesus has overcome the world. There cannot be peace without turmoil. The lack, unfruitfulness, joblessness,. . . family troubles are fixed on our path in life. We are on stormy seas. This is not the case of suffering and deceiving yourself by smiling or pretence. It is not saying “It is well” as a slang but having faith that it is truly well with you and that situation. It is a TRUE state of calm. Sleeping in the face of the storm like Jesus did is peace. God. When you trust God, you have complete faith in Him to take care of you. You know that He will never leave nor forget you. You are certain of His love. You are sure that He has power to save. You have that deep sitted assurance that God is in control. Since you have handed over your life to Him, you can be sure that He will drive you to safety. When Apostle Peter asked to walk on water like Jesus did, he got his desire granted him. Only for as long as he fixed his gaze on the master though. Immediately his thought shifted from the Master of the Universe, he began to sink. If we allow our hearts to be totally fixed on God, we will experience perfect peace too. Fix your eyes on the Almighty God and stop giving attention to your troubles. God is mighty to save! Hallelujah! Trust the Prince of peace completely henceforth and see the miraculous happen in your life- You begin to live in perfect peace irrespective of the situation around you. It’s actually up to you.